Let’s assume (smiley face inserted here) the NHL "tentative" agreement is formalized in the hours ahead. A season should/will begin my January 19 at the latest. Brian Burke has not been alone in preparing for this state of “readiness”. You can bet NHL General Managers across the board have been watching the bobbing and weaving of the ever-going-sideways-it-seems labour talks with great interest, because each team has a lot of work to do in a short period of time to get ready for a season that, suddenly, is around the corner. So an uneasy truce will lead to an unhealthy alliance, rather than a great partnership between the owners and players. But the truth is it was never much of a partnership anyway, so we move on—and so will the players and the owners. All this said, how much fun, for example, will the trade deadline be this year? It's always something to look forward to, and though some deals get done earlier than the deadline, of course, this spring should be something out of the ordinary. Because of the very peculiar late start to what will be a short (48 game?) season, we can assume the customary trade deadline will be pushed back well into March. So we will, initially, have 30 teams bustling around trying to get ready for opening night, and then a whole new re-jockeying for position at the deadline as they all prepare for the sprint to the finish and the playoffs. Will we have more teams in the playoff race than usual because of parity—and because they haven’t had time to play themselves out of the playoff picture, and thus we see fewer trades? Or will teams still need to move salary and prepare for the cap in 2013-'14? It could be awfully entertaining. But let’s bring this close to home. Some think the Maple Leafs are in great shape because they only have a certain amount of money committed to existing contracts. I’m not enough of a roster planner/money guy to know if that’s such a great thing with a season potentially only days away, but I’ll assume the Leaf brass has known exactly what they were doing while getting ready for—and waiting out—this CBA dispute. So how does the roster look? I’ve said here before that in my view the Leafs do not have a strong roster overall, but if certain guys play to their potential and goaltending becomes a strength not a weakness, in a short season Toronto can make the playoffs in a parity-riddled Eastern Conference. This may be a good time to set some “grades out” as well, without the emotion of a winning streak - or another wasted season - at our back. This position may hold the biggest “asterisk” of all for we Leaf faithful. Some fans love Reimer. Others see his flaws, question his glove hand, his consistency and of course, his health. I’m a Reimer guy, in the sense that I have loved his attitude in this market from Day One and the fact that I really think he can play. I believe that, if he is healthy and plays like he has shown he can, albeit briefly, he would be a perfect guy to face the ups and downs of a serious playoff run down the road, when the Leafs get to that point. I see a goaltender who has been through a difficult season and a steep "learning" curve in this market and is still strong mentally, much like a Felix Potvin or Curtis Joseph before him, who could put bad games behind them quickly, especially at playoff time. Scrivens can play, too. If the question is: can the Leafs get to the playoffs with Reimer and Scrivens in the next year or two, I think the answer is yes. But if the question is can they ever win a Stanley Cup with these guys? In my view, the answer is no. This brings us to the months-old Luongo debate. I personally am not a fan of bringing him in, for reasons I’ve posted here before. But I recognize that management may want (despite their public support of Reimer to the contrary) an immediate upgrade (many fans, too), and he is indeed the most prominent goalie “out there”. Does the new CBA alter this possibility, because of Luongo’s lengthy contract? I don't know. Some of you who follow numbers and potential contract “impact“ know a lot better than I. As we speak, it's Reimer and Scrivens. In 48 hours, we may be having a different goaltending conversation. Dion Phaneuf is our top guy, and that makes me nervous. While not, in my mind, an NHL All-Star (not even the mid-season variety) he is a good NHL rearguard. Yet I saw too many guys go around him like he was standing still last season to make me feel he is anything like a true first-line shutdown defenseman. He started the 2011-’12 season on fire, but cooled off considerably along with the rest of the team as the season wore on. Is Phaneuf a front-line guy getting better, or is he what we have already seen? For me, he is at best a “B+” NHL defenseman and was not even playing at that level by the end of last season. I don’t have to describe Jake Gardiner to any of you. Anyone who has seen the Leafs last season or the Marlies this year knows what this young man can do. Smooth skating, calm, nerves of steel, excellent on-ice vision. He is smart, an elite player—and still getting better. The recent head-area injury is a concern, but that is today’s NHL. Everyone is one hit away from missing a lot of hockey. It’s just the way it is. As I’ve said before, my only hesitation in crowning Gardiner a star is this: I don’t know how good he will be in front of his own net (and in the corners in our zone) when the play gets serious in the spring and playoff time. Two all-time "offensive" Leaf defensemen, Borje Salming (left) and Tomas Kaberle, often struggled in front of their on net, in terms of their inability to be physical and take out opposing forwards. In their cases, they usually made up for it with their passing skills, ability to skate away from trouble and their offensive prowess (and in Salming’s case, his guts and shot blocking ability…). Gardiner has some of those same offensive abilities. But for Gardiner, the jury is still out. For very different reasons than Phaneuf, Gardiner is also, for me, a B+, but with a higher ceiling, of course. Carl Gunnarsson is one of my favourite Leafs, for a bunch of reasons. I like guys who don’t say that much but just play the game quietly—and well. He generally minimizes his mistakes, and while I sense he could be more “offensive”, he focuses on making his partner better and trying to keep the puck of out his own net—not something we have been very good at in Toronto the last few seasons. I’m not sure he will ever evolve into a “mini-Lidstrom” but I like him on our blueline, and would be disappointed if he goes the other way in a big trade. He’s a solid B, with some upside on a better team with an improved supporting cast. Now things get tricky. Does Paul Ranger slide in here as the “number four” Leaf defenseman? While he has certainly contributed to the Marlies throughout the first half of the current AHL season (and brings valuable NHL experience to the table) I can’t really say if he will be a major upgrade over what we have had here recently (Beauchemin, Schenn, Franson, et al). I can’t grade him fairly, but I am slotting him here because Paul Hendrick told me and Matteo Codispoti (We Want a Cup) on a recent “Leaf Matters” podcast Ranger may well slide in here. It makes some sense to me. If you had asked Leaf fans for a “grade” on John-Michael Liles exactly twelve months ago, my guess is it would have been a high B or even a low A. Most Leaf observers were pretty impressed with his puck-moving ability and his skating. A serious injury almost shut down his season, and seemed to impact his confidence and curtail his effectiveness once he did come back. For now, I’ll give him a B-, hoping he can hit that higher rating point. But I wouldn’t argue with those who put him in the C+ category, either. Mike Komisarek is a guy I respect as a hard-working NHL player. He’s tough and seems to possess so many of the attributes you want on your team, including being a legit team-first guy. But years into his time here, (and I spent the last two seasons saying he would eventually play like he can) I can’t rank him higher than a C-. Can he do more, with Randy Carlyle as his coach? Perhaps. Will he be bought-out? We'll know this week. I have no idea if Cody Franson is coming back. Do Mark Fraser or Mike Kostka have a shot at cracking the Leaf roster? What about Gysbers, Holzer and the kids—like Blacker? I’ve already made my feelings known about Morgan Rielly in my recent post here. I don't even want to see him at Leaf camp, but I’ve been out-voted by a rather more important segment of Leafworld: the Leaf coaching staff and the management brass. Clearly, rosters could change between now and January 19th, if that is indeed when the NHL season will start—but how radically? Is there really time to make a lot of moves instead of mostly going with the status quo? It has finally happened. We are back talking hockey. I am elated, to say the least. I like your grades for the most part. Not sure why you didn't give the goalies one. I sure hope that Gardiner recovers from his upper body injury quickly and continues to improve. Agreed, Jim. Good to be talking Leafs knowing there will actually be games ahead to look forward to! As for the goalie ratings, I shied away because of Reimer's injury and the fact that I just don't know where to place Scrivens as an NHL goalie. I'm sure there will be a wide range of views on the other "grades"! I am going to be honest and say that this is Burkes last chance at making this team a competitive one. All thoughts of him getting more time are gone for me. If this ship isn't going the right way in a great big hurry, he needs to go. I can't listen to anymore of his press conferences about things not going the way they thought they would. I really can't. Things are either the way you saw them as a GM, or you have proven to not be very adept at that aspect of the business. I never want to hear, 'We thought we had a playoff team' from this guy again. With that said, since you accurately predicted the end of the lockout last night. What moves do you think he has in the wings? And more importantly. What would you do, from a realistic standpoint, if the job was yours? -I would be looking for goaltending help asap. I'd look for something short term, with an eye on a longer-term, "answer", while still developing Reimer, who I like. Yes, while I have been publicly against acquiring Luongo, it could be Luongo, if expectations were contained. -They have to land a premier offensive talent. Relying on Kessel is not a winning game plan. I fear that he will be easily shut down in any tough playoff series unless there is a lot of "back-up" help beyond Lupul. This could happen in free-agency, though we have not had much success in that regard over the years. -We need to address, as I have posted here for ages, the issue of team toughness. We lost some of that in Schenn, gained some with Komarov. But we are miles away from being hard to play against for the most part. -We are woefully short of experience. While it's too late now, someone like a Mike Knuble vintage 2005 would be great. A guy who brings sandpaper and lots of playoff experience on some good teams would be nice. It's difficult to talk in specific terms Jim, as in particular players. But I'd love to get my hands on a player who will become something in the next two to three years, as opposed to too many guys who were strong years ago and are now on the downside. For example, it may be a little late to benefit from acquiring someone like Iginla, as good a player as he has been. I'd also like to find players who want to be here, in Toronto, and be a Leaf for life. Not sure if that covers some of it, but while van Riemsdyk is a welcome addition (though at a cost) I don't think the status quo cuts it. You have my support for GM. The game plan is a good one, the execution is all that's left. Yes, I did mean that both ways. Burkes, and how well you carry out your game plan as GM going forward. I'll stand by, Jim! Meanwhile, I'll focus on my day job, and keep working at building up Vintage Leaf Memories! Thank God it's time for hockey. I can't believe how good it is talk about hockey without hearing about spoiled players, greedy owners and two front men whom I couldn't care if I ever saw on TV again. I like your grades but i think I would have bee a little tougher. Phanuef gets a B+ from me as well. He does some things very well but has some serious shortcomings as well. Gardiner gets a B. He seems to have great potential but I have to see it on a regular basis. I too fear his defensive shortcomings may hurt him in the long run. Gunnarsson gets a C+. He is decent defensively, not overly physical but rarely out of position. He is a solid player but really in the end is he all that unreplaceable? John Michael-Liles gets a C. Just an average NHL player. Not good, not bad just average. Franson gets a C-. He is just there. Komisarek gets a D. He just runs around too much which is a shame because he brings all the intangibles a team mate could want. I'll never forget him fighting Lucic in the 9-0 loss. The man has balls. As for the rest the only guy who might have an impact in the NHL right now is Paul Ranger. In truth I would rather have him than Franson. The rest either aren't ready or would only be bit players. PS. Like your GM thinking. Definitly found the weak spots. Yes, it is good to talk actual hockey again isn't it, Willbur? I can't argue with your assessments (or grades). Maybe a bit harsher than mine, but I sense we are in the same ballpark in trying to determine objectively where the Leafs are. And if we never hear from Donald Fehr or Gary Bettman again, that would be just fine. Thanks Willbur. I will echo everyone's sentiments and say that it does feel good to talk hockey again knowing there's something to anticipate! For sure I've been rather quiet here of late, there's only so much you can say while you wait nine months for things to start back up again. I am on the fence with the Luongo thing. Goalies are impossible to predict when they're young. You might happen upon a budding superstar, but you might get a flash in the pan for a couple years, or a can't miss prospect who never does make it. So if I were GM, I'd look for a solid veteran. I just don't know that I'd want to take on a monster contract to do so. I'll also admit ignorance as to what the new CBA means with Luongo's contract and its long-term impact on the team that gets him. I think most of us are in consensus that Phaneuf is overrated, and I don't think that bringing him in here and handing him the captaincy has done much to deflate his ego. I still believe he can play better, and I hope he finds the motivation. Let's face it, they've invested way too much in him, they will NOT get rid of him, so let's get the most out of him. I continue to feel good about Gardiner's future, I think he will be just fine at both ends of the ice. Same with Gunnarsson. Liles I will cross my fingers that he will return to form. Komisarek, gotta love the guy, it's just been too many bad breaks for him. I can see him being a buyout player if they don't want to wait for his contract to expire. That would give them the room needed to experiment with all these "ready for NHL" guys we keep hearing about. Maybe the nine months since they last played has skewed my thinking. But I've grown bored hearing about how Franson, Blacker, Holzer, and Ranger are bursting with anticipation ready to make an impact. It's time to get some of them some NHL experience to let us know for sure what their long term value is, before Rielly and the younger guys are ready to step in and push anyone aside. Great post, Pete. I hear you on your last point. I'm hoping the Rielly talk is mostly to nudge the guys who should be ahead of him on the depth chart. I'm concerned that they are already building the expectation he should be on the team. Well, I'm somewhat happy the lockout was settled. We should have stability for another 8 years. But this one has left a bad taste in my mouth - mainly because of the disrespect it showed both owners and players have for the fans a/k/a the golden geese. And a 50 game schedule is, at best, an asterisked Stanley Cup year. But you just knew the owners weren't going to give up that playoff money! That rant aside, here we are - not much further ahead than last year. Two unknown quantity goalies, average defence corps, dog's breakfast forward lines. Will our new coach be able to mould this group into a cohesive unit in just over half a season? Cautionary note: Ron Wilson did just that last year. The ratings: I saw Scrivens in a few Marlies' games this fall - he looks more assured than last year, but I just don't see a dependable NHL level guy. May he prove me wrong! Reimer - who knows? Nice guy, yes, but unless he can cover that top shelf glove side, no chance he's our man. Luongo? He couldn't deliver the big game with an A+ defence corps. Unless Carlyle's much-ballyhooed defensive system really kicks in with the Leafs, even Georges Vezina wouldn't be able to save this squad. Defence: There are so many guys I WANT to like here, but they all have pretty well fallen short so far. We don't have 1 "A" level guy, that's for sure... over 82 games, at least. Maybe it will be different when the fatigue factor doesn't kick in. Don't forget - even if a team has to play four seven-game rounds of playoff hockey, they will still have played fewer games than just a normal regular season. So will Phaneuf have a year that builds on his first half last year? Hope so! I liked Franson last year - when he was on his game. Unfortunately, that wasn't too often, and he'd apparently incurred the wrath of Wilson, which further impeded his season. Komisarek is another guy I keep hoping to see bounce back. We saw flashes of it last year, but, like Phaneuf, he made too many bad decisions and looked too slow too often. Gunner - dependable, stay-at-home, don't expect much difference there. Liles and Gardiner - two keys to the power play - will both be coming off concussions. Liles was not the same after his return last year, and who knows how Jake will respond? Holzer, Blacker, Ranger - from the games I've seen, they could all fit in as that 7th man, but I don't see anyone who's head and shoulders above the current crew. You've hit a lot of the key issues, Gerund O'. We share many of the same questions about the roster- but thank goodness we're talking hockey. Games start next week, evidently. We'll have more to chat about then! I am really torn going into this season. I can't really tell whether the Leafs will finish in the lottery or in the playoffs. Right now it seems like they are a team in transition. That may turn out to be one of the fun things about the 2012-'13 NHL season- what there is of it, Matt (Five Minutes For Fighting). We have no real idea where the Leafs are at; they may struggle, or they could be a playoff team, and in a shortened season, who knows what might ensue? But strictly looking at the roster (without some surprise upgrades) it looks like a team that could float anywhere between 8th and 12th place. The East has a lot of just OK teams, so we will see what Carlyle can do with this group. Thanks Matt. A Sensfan here, like your posts so Ill give my two cents. Toronto will live and die in the net..end of story. Anderson/Miller/Price are proven #1's and Rask will be insulated by the Eastern Conferences best defence. Injuries to starting goaltenders mind you are a factor in this short year which may benefit Toronto. However there all still major issues Toronto still has to worry about. PP and PK HAVE to improve beyond the bottom five. Depth at center is still an issue. Scoring should not be a major issue, though questions of Lupul/Kessel repeating career years do exist. However the question is the same as you discussed way back at the end of last year. Is Toronto bettter then the Devils/Senators/Caps/Canes/Buffalo/Habs/Jets/Panthers? I can't debate your Leaf roster critique much, Sensfan- I believe you have fairly broken down the current roster realities. I do think a handful of teams are "givens" to be in the Eastern Conference playoffs, along the lines of the goaltending quality you outlined above. I'm just not sure if the Jets are quite there yet. And I wonder if the Panthers will build on last year's improvement? I sense some spots are up for grabs and the Leafs could be one of the clubs positioned to take a run in a short season. But we'll see. I'm not into predictions, so I'll just say there is work to be done with this roster. Thanks for chiming in, Sensfan. I agree with the Jets not being ready, and a potential step back by the Panthers. Pending injury Boston/Pens/Flyers/Rangers are locks. + 1 Southeast team automatically. For everyone else its a race for spots 6th through 8th. Paul Ranger can't be on the Leafs' lineup at the beginning of the season because he doesn't have an NHL contract. Thanks Anon (re Ranger)- I was under the impression they could choose to sign him to an NHL deal before the season begins. Well Michael, as often the case we think similar. I'm very uncertain about the goalie situation for the Leafs. We've seen glimpses of great goaltending from Reimer, but not enough to say he's going to be a #1 guy. I've seen enough of Scrivens that I think at best he could be a #2 goalie, but he lacks any special skills you want in the makings of a #1 goalie. I don't feel Luongo is the answer to the Leaf's problems, though he would make them a better regular-season team. I just don't like the idea of giving up much to get him, and as they say in the "Dragon's Den", "for that reason, I'm out!" As for the defense we all have some areas of concern. Despite Hendricks +ve assessment of Ranger, I'm not sure I'd consider him a top 4 guy. That being said, there is serious questions as to whether he is mentally ready to come back to the NHL just yet. 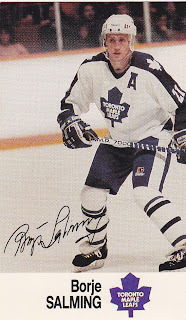 I hope the Leafs don't get so desperate on D that they push him to make the jump before he's ready to play NHL again. Liles is a lovely offensive D-man, but nothing more. He can get caught up ice, and he's weak in his own zone. Maybe Carlyle can change that, but I'm not so sure. I really don't feel Franson, or Komisarek have been given sufficient ice time to show if they are reliable defencemen, or what they can provide this team. They have a lot to prove to Carlyle and to the coaching staff. I'm prepared to give them a chance, but wouldn't hesitate to upgrade given the opportunity. Holzer and Kostka are certainly interesting guys, and hopefully at some point will get a chance to show what they might bring to this team. Interesting that you say what you did regarding Ranger, Don (TML_fan). I was thinking along those lines as well- is there a need to rush a guy back to the NHL? Maybe he is keen for exactly that, but he seems to have enjoyed his time in the AHL and is playing relaxed. Maybe a move later in the season may make more sense? Bottom line, there are plenty of roster questions. Not a lot of answers, yet.